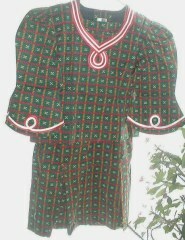 This is a fully lined unique African design skirt set. The top is a is lightly formed with princess seams. It measures 17″ from shoulder to shoulder and 22″ from shoulder to hem. Shoulder pads give a tailored look. The round neck trimmed with a V-neck piping design is a Fashion by Grace. The sleeves are bell shaped and trimmed to accent the bell design. The long skirt is also fully lined. It has a smooth waist band front and back and elastic on the side for comfort. The waist measures 28″ relaxed and 34″ fully extended. It measures 38″ from the waist to the hem. The drop to about mid thigh is straight then the skirt expands with 4 large pleats. The two front pleats are topped with buttons.